A lone tree by rocks on Down Tor lit by the late afternoon winter sun. 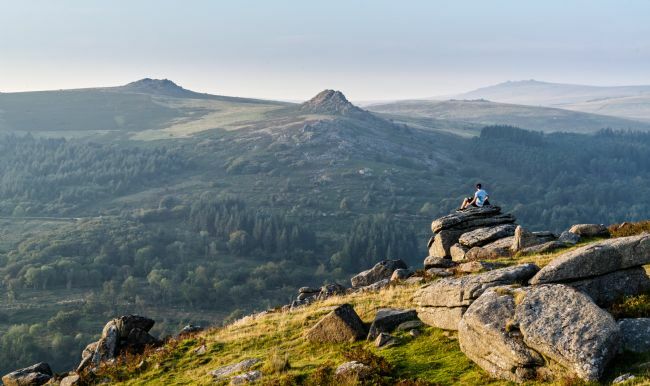 Down Tor is in the southwestern area of Dartmoor National Park UK. Early evening in autumn at the Burrator Reservoir on Dartmoor. The water level is low following a fairly dry period. The 'beach' that becomes exposed is a lovely place to walk near the water. On Combeshead Tor in the Dartmoor National Park, looking towards Sheeps Tor on the horizon. The photo was taken on a walk from Norsworthy Bridge. 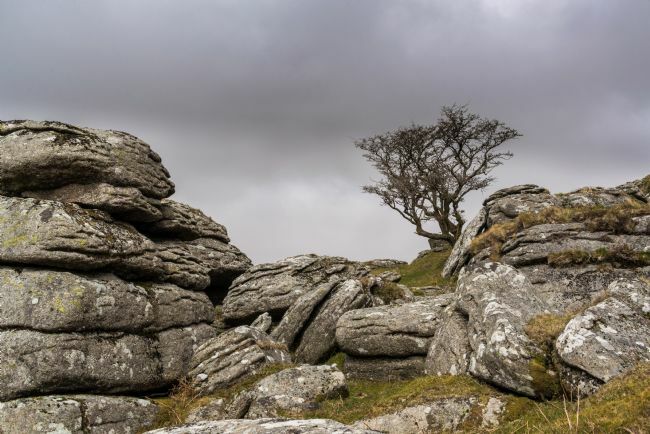 A hawthorn tree amongst the rocks on Combeshead Tor, Dartmoor - against a moody sky. Near Down Tor on Dartmoor under a moody sky. In the distance, on the skyline, can be seen the outline of Gutter Tor. This is in the southwest area of the moor. A lone tree on Down Tor just before sundown in winter. Down Tor is in the south-west corner of the Dartmoor national park. In the picture, this is looking south towards Gutter Tor silhouetted on the horizon. A distant view to the snow-covered Dartmoor tors from Saddlesborough Trig Point on Shaugh Moor. The tors seen in the image are, from left to right, Sharpitor, Great Mis Tor (beyond Sharpitor), Leather Tor and the summit of Sheeps Tor. Further to the right, in the distance, is the TV mast on North Hessary Tor, Princetown. Huccaby Bridge (also known as Hexworthy Bridge) spans the West Dart River in the Hexworthy area in the middle of the Dartmoor National Park. A lovely golden light spills onto the river under a Dartmoor stone bridge. 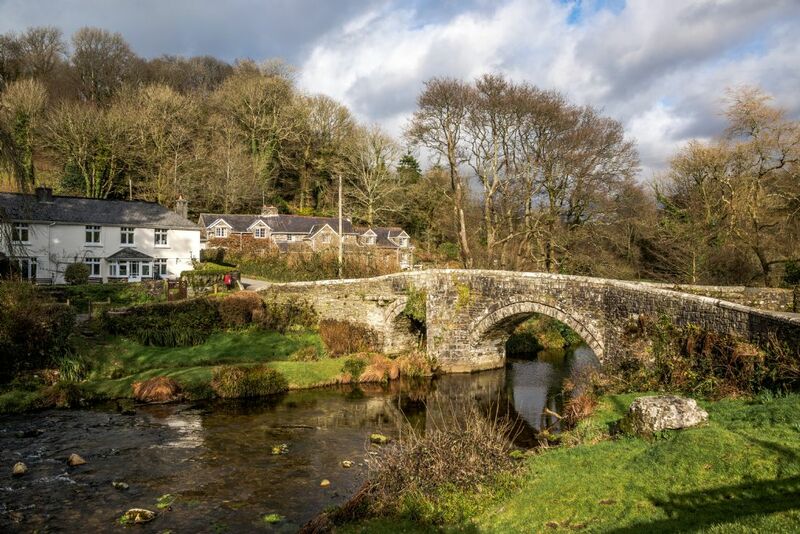 This is Hexworthy Bridge (also known as Huccaby Bridge) which spans the West Dart river in Hexworthy. A cloudy and damp day in November, when momentarily the sun broke through the clouds illuminating the fields below. A few seconds later it was gone. 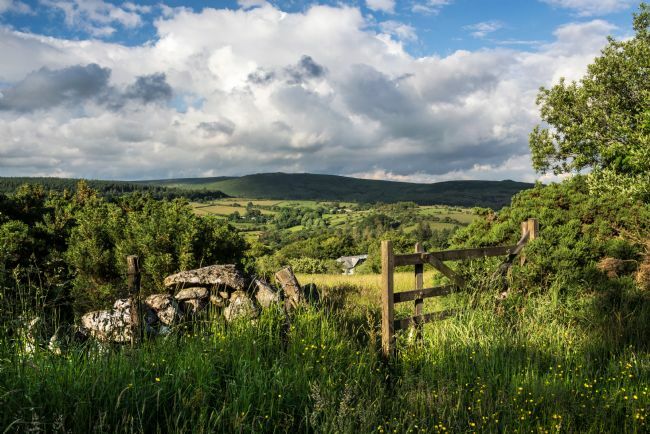 This area of farmland is near the small village of Sheepstor in the Dartmoor National Park. 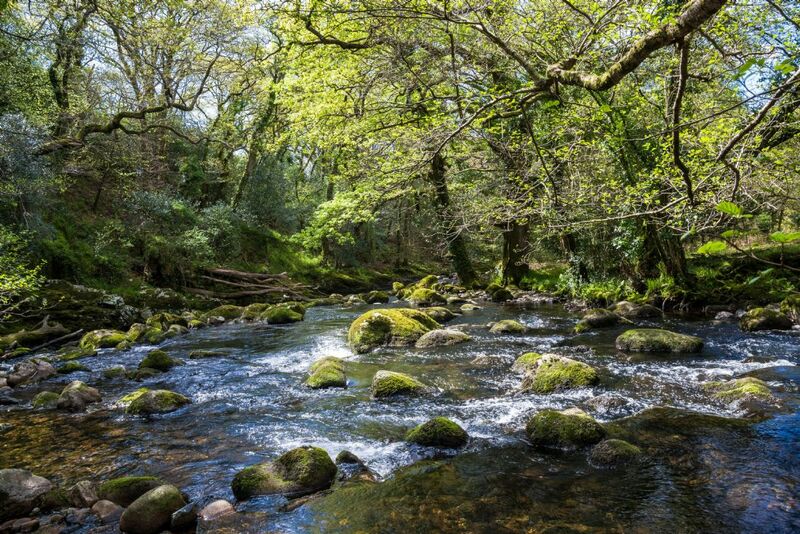 The River Plym, south of Shaugh Bridge in Devon on the border of Dartmoor. From this lovely part of the river, it flows on from Shaugh Bridge to Plymouth to the sea at Plymouth Sound. From the rocks on top of Sheeps Tor, Dartmoor, watching the sun going down. Late August. A lone tree on the lower slopes of Yar Tor in the Dartmoor National Park. Yar Tor is uphill from Dartmeet - a popular tourist spot on the moor. A pony with her foal on Sheeps Tor in the Dartmoor National Park. The tors In the background are, from left to right, Sharpitor, Leather Tor and distant Great Mis Tor. On Dartmoor, with a glimpse of the Burrator Reservoir near Norsworthy Bridge. A lone sheep is grazing on the far bank. A glimpse of Snappers Tor through the trees. This small tor, which is not much more than a pile of granite rocks, is in the Burrator area of the Dartmoor National Park. It is not marked on the Ordnance Survey maps but is mentioned in various publications. The moody rain clouds add a touch of drama to the scene. Tree by a stone wall, near Deancombe on Dartmoor. Mid-April. In the southwestern area of Dartmoor, near Deancombe on a walk towards Down Tor. This is looking back to Snappers Tor with Leather Tor and Sharpitor on the skyline. Snappers Tor is the rock pile in the middle distance on the left of the scene. Sheep coming through a gate on the Narrator Plantation, in the Sheepstor area of the Dartmoor National Park. Early November. 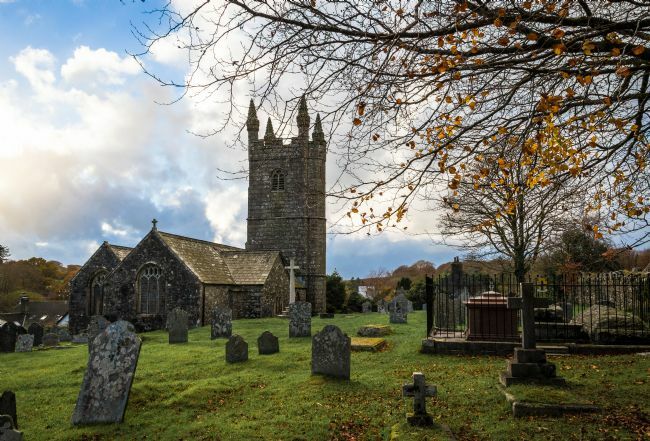 This is in the Sampford Spiney area of the Dartmoor National Park. A little further along, the road crosses Plaster Down before arriving at the ancient stannary town of Tavistock. 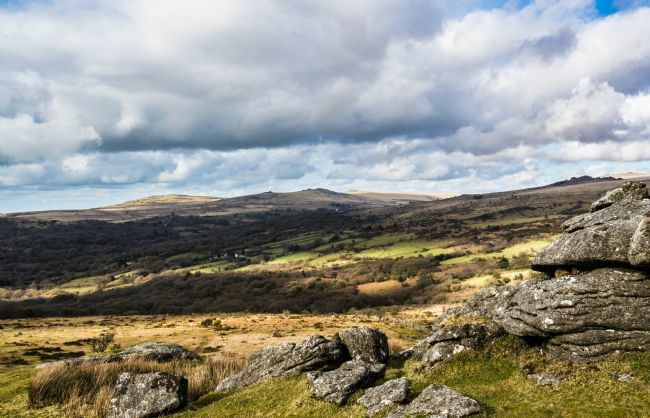 This area of Dartmoor is unusually flat for the moor, though there are several tors nearby. 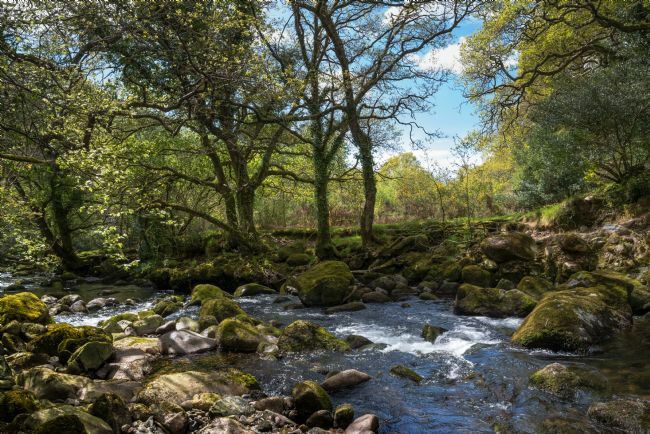 The River Plym near Shaugh Bridge on the border of Dartmoor. Looking across Burrator Reservoir to Leather Tor on the skyline. The water level was particularly low after a dry summer. Normally, the dry land in this scene would be covered in water. 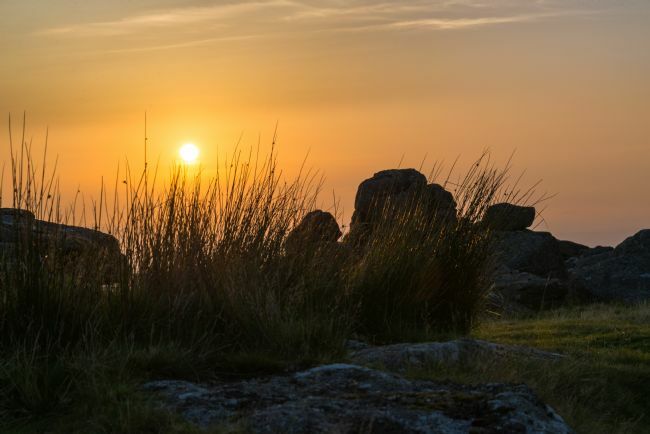 This is on Combeshead Tor in the south-west area of the Dartmoor National Park. 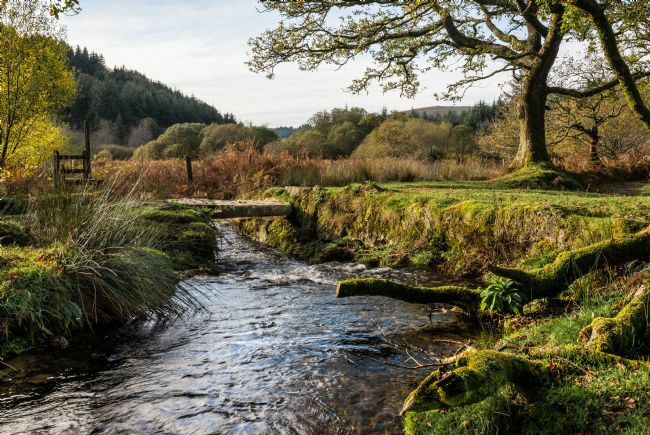 It's about a 1½ mile walk from Norsworthy Bridge at the Burrator Reservoir. 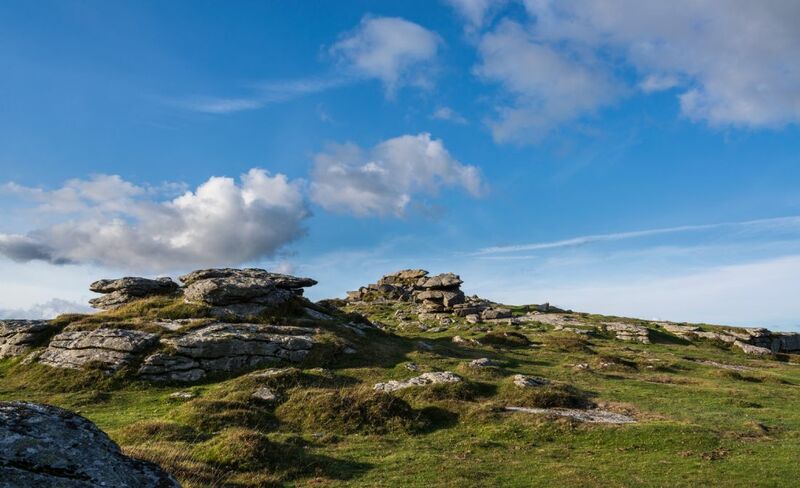 A pleasant, and not too challenging, walk taking in Snappers Tor and Down Tor on the way. A slight deviation to the route will bring you to the impressive Down Tor stone row (AKA Hingston Hill stone row). Stone walls in the Deancombe area of Dartmoor. These old stone walls would have been boundary walls for the farms that have long since been abandoned. In the distance are the trees of the Roughtor Plantation with Gutter Tor beyond. View towards Vixen Tor, from Walkhampton Common, Dartmoor on the way to Ingra Tor. In the distance is Great Mis Tor. Pew Tor under a mackerel sky in the Dartmoor National Park. 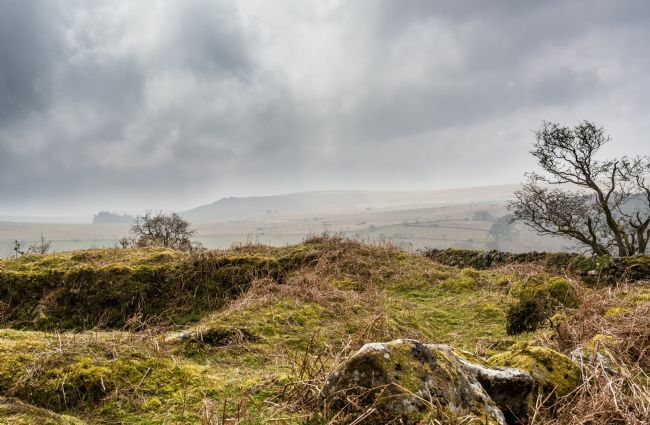 This is the Thrushel Combe Brooke near Drizzle Combe and Ditsworthy Warren in the southwestern area of Dartmoor. It can be quite boggy around here especially after a spell of wet weather. This is the Brisworthy stone circle, a Bronze Age monument on Ringmoor Down in the Dartmoor National Park. There are several stone circles and stone rows dotted around the moor. Many have been restored where stones have fallen or gone missing. This particular one is not far from the River Plym, with a stone row nearby and several tors in the vicinity. Along the banks of the River Plym at Cadover Bridge in the Dartmoor National Park. Being located just a few miles from Plymouth, it is popular spot for a days outing and can get very busy in the summer months. An ice-cream van is usually present on the west side of the bridge. 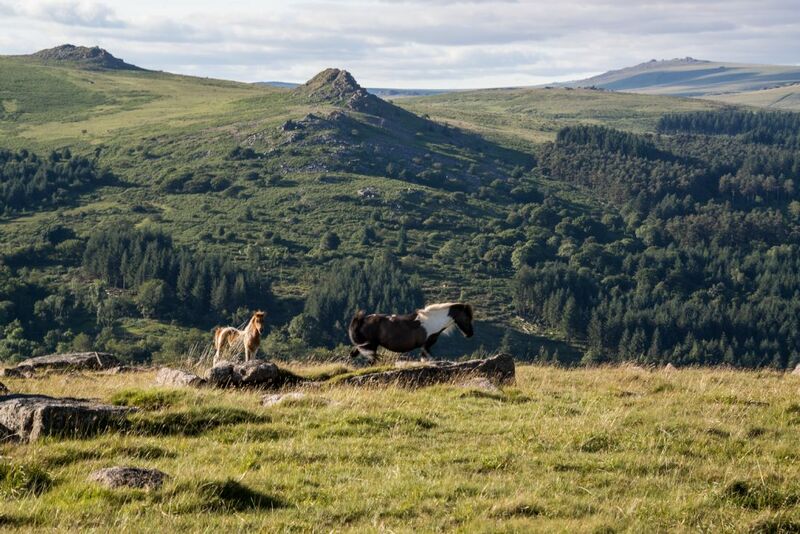 A couple of Dartmoor ponies can be seen grazing peacefully on the river-bank. The derelict Ditsworthy Warren House is a grade 2 listed building in the Dartmoor National Park. It attracts many visitors since it became famous when used as Narracott Farm in Steven Spielberg's film War Horse. The building was 'dressed' for the part, then returned to its derelict state when filming was finished. It is situated in open moorland with several tors and the River Plym nearby. Looking across the moorland from Brisworthy on Dartmoor. 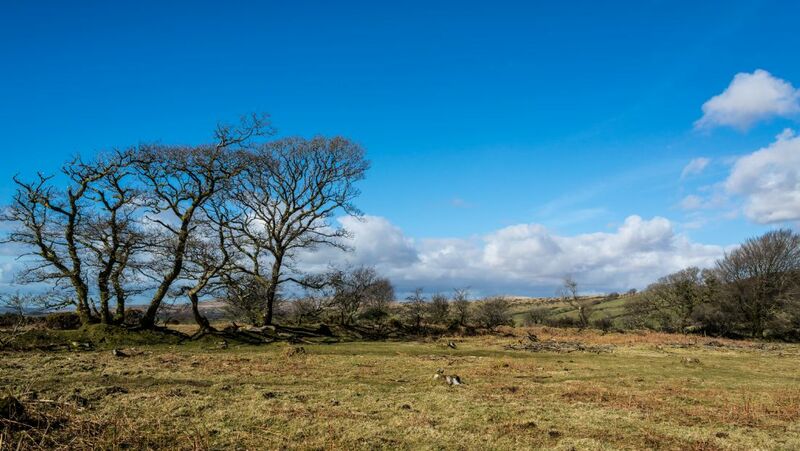 This part of the moor is close to the River Plym with the Brisworthy stone circle and a stone row nearby. Several tors are also in the area. The church of St Leonard and Sheepstor Village, nestle in the valley below Sheeps Tor; the lower slopes of which can be seen far right. 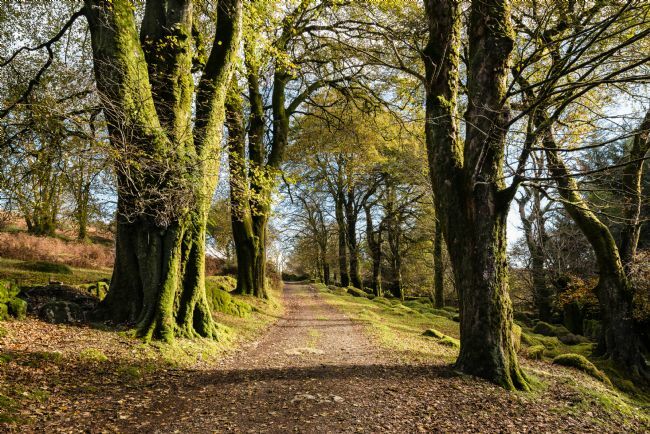 Nearby is the Burrator Reservoir, a beautiful area of Dartmoor to explore in all seasons. Looking across the reservoir from the south-west side. This is a beautiful area of Dartmoor and is surrounded by woodland, tors, rivers and moorland. Plenty of places to explore, or just take a walk around the reservoir. The low water level at the Burrator Reservoir created a 'beach' and from here, looking over the water, we can see Leather Tor on the skyline. Normally, this 'beach' is completely covered by the water. This photo was taken mid-October 2015 following a drier than normal summer. An angler in silhouette at the Burrator Reservoir - Dartmoor. A beautiful autumn day for a walk around the lovely Burrator Reservoir. The light filtering through the trees brought out the colours of the leaves and increased the pleasure of the walk. This lovely track, known as Joey's Lane, is located near the village of Sheepstor in the Dartmoor National Park, UK. How it got this name, or who Joey was, is unknown. 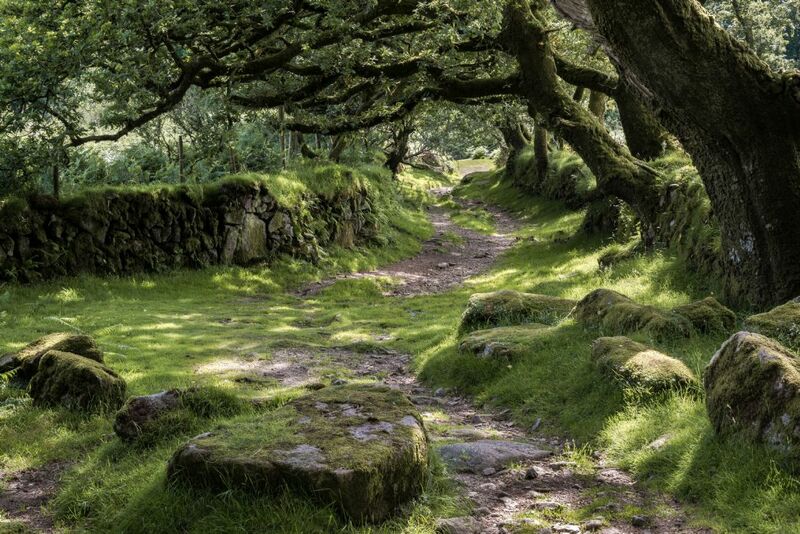 The track strewn with moss-covered boulders was a packhorse track in bygone years. Now it is a route to the base of Sheeps Tor, or to another track around the base of the tor. Always a pleasant place for a walk. The sun filters through the trees onto the bracken and moss covered stone wall in the Beechcroft Plantation on Dartmoor. The stone wall is probably what is left of a farm abandoned many years ago when the Burrator Reservoir was constructed nearby. This is the view outside the grounds of Ditsworthy Warren House. In the distance is Hen Tor. This area was used in the making of the film War Horse by Steven Spielberg. The derelict house, not shown here, was used in the film as the farmhouse. The Narrator Brook cuts through a little track leading from Deancombe in the Dartmoor National Park. In this photo, you can see the small stone clapper bridge that crosses the brook - accessible to walkers and mountain bikers. Deancombe itself is reached along a track from the Norsworthy Bridge area near Burrator Reservoir. This is a lovely little spot to rest awhile and enjoy the tranquillity and sound of the flowing water. A lovely wooded area in the Burrator area of the Dartmoor National Park. Especially lovely when the bluebells are in flower over the undulating woodland floor. The Cave-Penney Cross on gorse covered Corndon Down, Dartmoor. This memorial is to the memory of a young soldier who lived locally and who was killed in the First World War. The inscription below the cross reads.... To the glory of God And to the dear memory of Evelyn Anthony Cave-Penney Lieut. Q.V.O. Corps of Guides Fell in Palestine whilst Gallantly commanding his men June 8th 1918, aged 19 Look up and lift up your heads. On Corndon Down high above Dartmeet in the Dartmoor National Park. The view is across the gorse-covered area below Corndon Tor to farmland and the moorland beyond. With the gorse and heather, the moor was particularly colourful this year. Corndon Tor is on Corndon Down in the Dartmoor National Park. 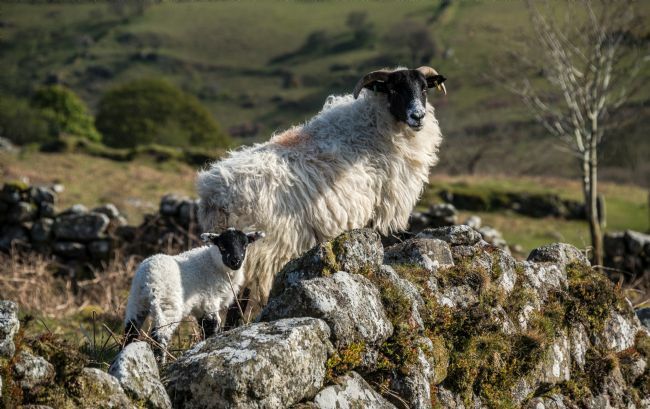 It is up the steep hill from Dartmeet and near Yar Tor and Sharp Tor - and from up here are spectacular views across the moorland and farmland. Huckworthy Mill is a Grade 2 listed building in the hamlet of Huckworthy in the Dartmoor National Park. It is next to the River Walkham and its lovely stone bridge. It is a particularly picturesque location, and in my opinion, especially so in late winter to early spring when this photo was taken. However, it is not the easiest place to get to, as the roads to the village are very narrow in places as is the bridge itself, which needs careful negotiating to avoid scratching the car! 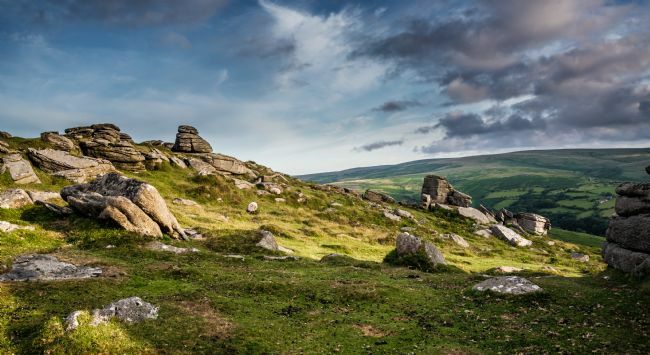 Yar Tor is high above the Dartmeet valley and is situated near the road to Sherwell and Babeny. It is an easily accessible tor with a small parking area just off the road. It is well worth the effort to make the climb to the top ( not too steep) as the views from up there are quite beautiful. It is late summer, and the day is drawing to a close as a haze settles in in the valley below. We are on top of Sheeps Tor in the Dartmoor National Park and enjoying the tranquillity of the moment. As we look across the receding farmland, we see below us, the church of St Leonard in the small sleepy hamlet of Sheepstor. This charming little village takes its name from the neighbouring tor where we are standing - a tor that seems to watch over the village. All is well. 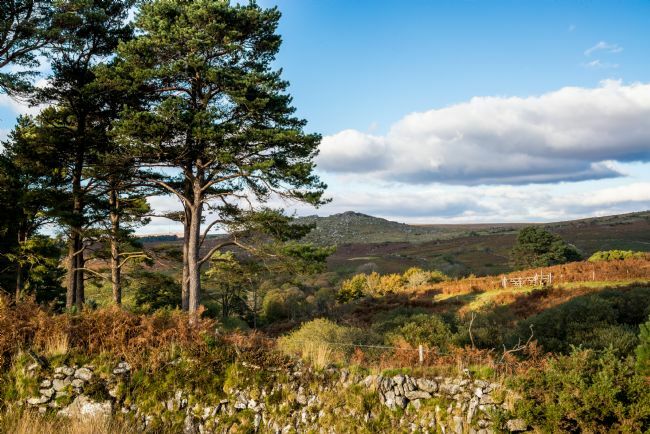 This photo was taken in autumn from the edge of the Roughtor Plantation in the Dartmoor National Park. You can see Down Tor in the distance, and behind you, to the southwest is Sheeps Tor. Moss covered trees by the Narrator Brook, in the Deancombe area of the Dartmoor National Park. Photo taken in Autumn. 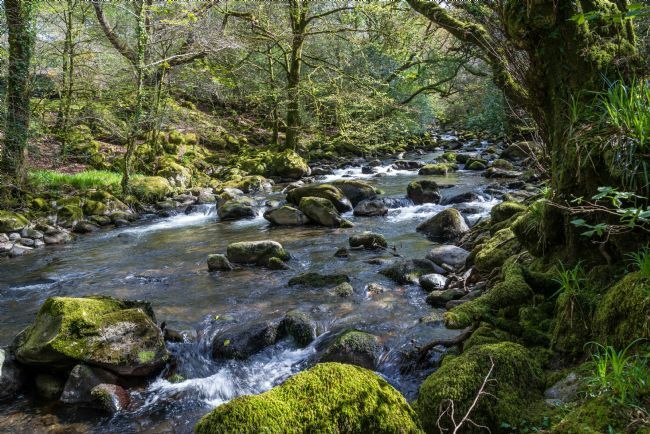 This is close to the Narrator Brook - near Deancombe in the Dartmoor National Park. A lovely autumn day. Along the Track to Deancombe from Norsworthy Bridge near the Burrator Reservoir on Dartmoor. A very pleasant walk on a lovely autumn day. This is a pretty area near the Narrator Brook in the Deancombe area of Dartmoor. It was looking especially lovely in its autumn colours at the end of October. 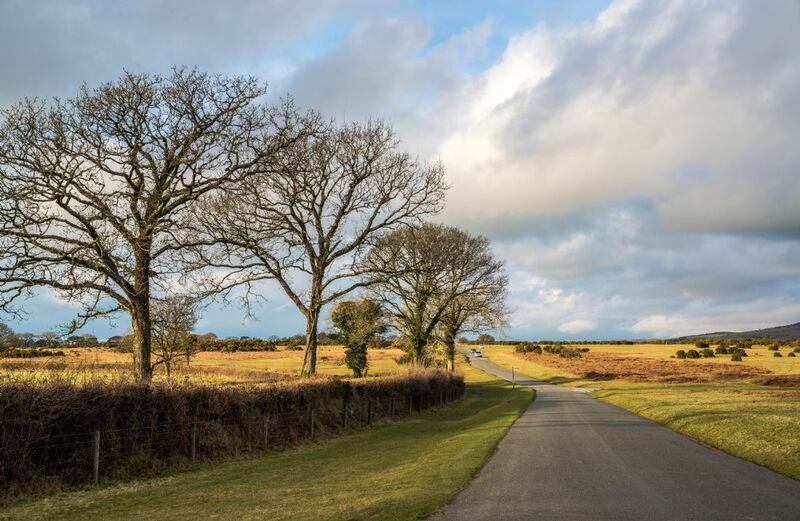 These majestic looking trees are near the parking area at Lowery Cross near the Burrator Reservoir. I always think that trees look their best in winter without their leaves and revealing the shape of their branches. Winter is a wonderful season for photograph: one reason being is that the quality of light seems so much better - probably because the sun is lower in the sky. Perhaps not a carpet of bluebells, but very pretty where they adorn the banks of this delightful undulating woodland. 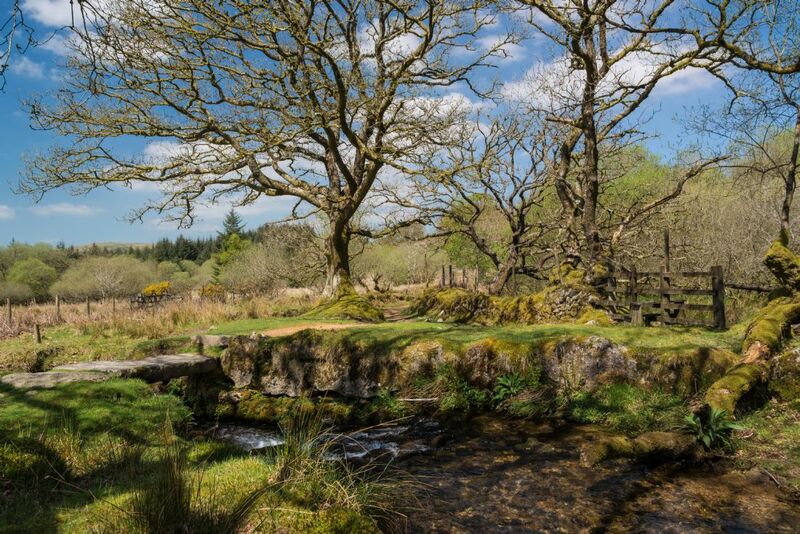 Photo taken in the Burrator area of Dartmoor in the middle of May. Ponies and foal approaching Norsworthy Bridge near the Burrator Reservoir on Dartmoor. Early June. This is the Newleycombe Lake, a small stream that flows from the moor to join the River Meavy at Norsworthy Bridge near the Burrator Reservoir. It clearly is not a lake, but no-one seems to know why it should be named as such. Whatever its name, it is a beautiful area along the banks of this stream and a perfect place to relax and enjoy a picnic. Photo taken late August. Farm gate and stone barn in the village of Sheepstor in the Dartmoor National Park. The village is near Sheeps Tor, the tor from where it gets its name, with the Burrator Reservoir a short walk away. I thought this image was a perfect subject for a black and white conversion. 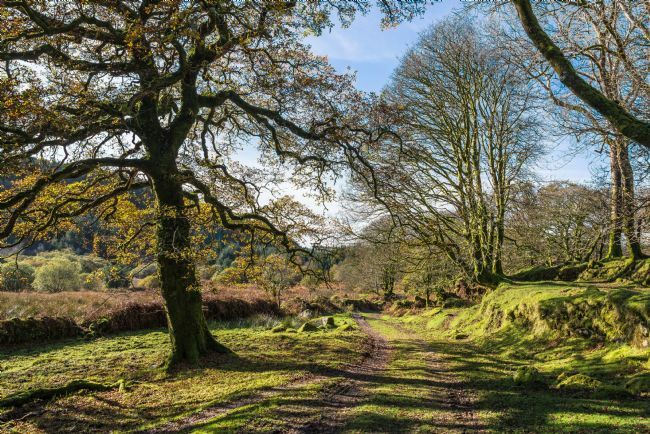 The Narrator Plantation is a lovely woodland area near the Burrator Reservoir in the Dartmoor National Park. The moss covered tree trunks and banks are a common sight on Dartmoor, and irresistible to touch the velvety surface. This old stone bridge is over the River Meavy, with a ford nearby, and is close to Meavy Village. Downstream, the river joins the Plym as it leaves the Dartmoor boundary, and from there, in just a few miles, reaches the sea at Plymouth Sound. Brisworthy Stone Circle - Dartmoor. 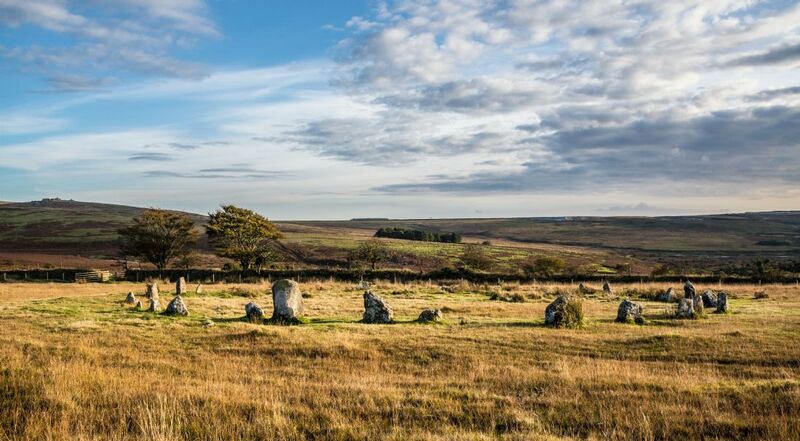 Brisworthy Stone Circle is situated at the southern end of Ringmoor Down in the Dartmoor National Park. Below, in the valley, flows the River Plym, and in the distance is Trowlesworthy Warren and Shaugh Moor. This stone circle is believed to be of the Bronze Age (some 4000 years ago) and was re-erected around 1909 from the stones that had fallen over the course of time. 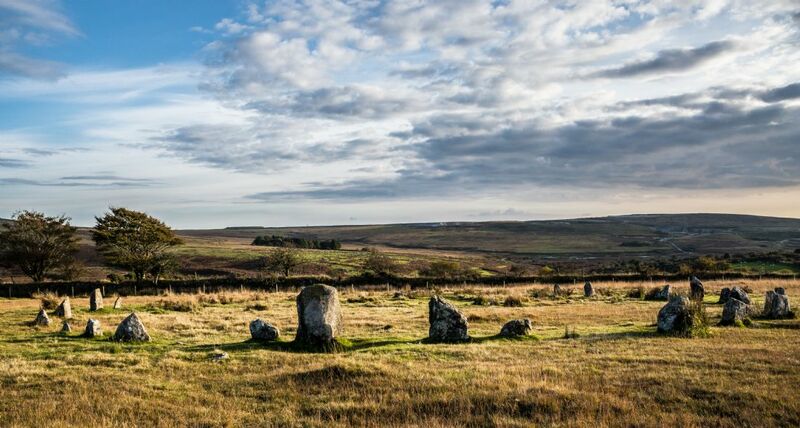 Not far from here, also on Ringmoor Down, is the Ringmoor Stone Row with cairn circle. This ewe with her lamb posed for me briefly on the stone wall, then quickly jumped down and ran off. I was lucky to get the shot, as they usually run away as soon as they see you coming their way. This track runs from Norsworthy Bridge near the Burrator Reservoir to Deancombe and the ruins of Deancombe Farm. The moss-covered stone walls you see in this image, are abundant all over Dartmoor. Leather Tor can be accessed from the main B3212 car parking area close to Sharpitor. 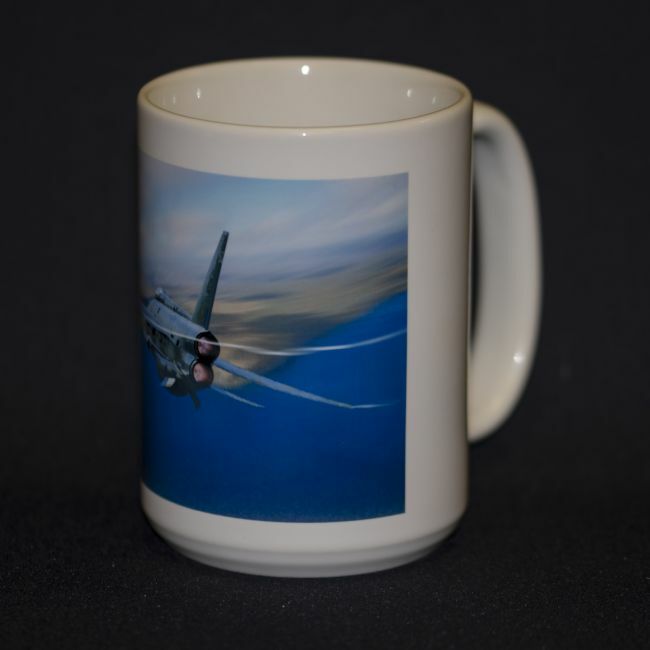 Both popular tors worth exploring. It is near the end of the day, and the mist is beginning to rise in the valley over farmland and the distant hills of Dartmoor. The photo was taken from the cycle track to Ingra Tor and Kings Tor. The track is actually a disused railway track which led from Princetown to Yelverton and was closed down many years ago. It is now used by walkers, joggers, cyclists and horse riders. The sun is beginning to go down over Dartmoor, the rays breaking through the clouds and penetrating the rising mist. There is one 'spotlight' over a field in the Walkham Valley. It was a beautiful scene to behold. On a lovely June day, this open gate is almost inviting you to walk through. The beautiful view beyond the gate is towards the Dartmoor hills and tors. This photo was taken from a track above Hexworthy on Dartmoor. Photo taken from Norsworthy Bridge, Burrator in late October. The river flows from here to the Burrator Reservoir on its way to join the River Plym at Shaugh Bridge. This is the Cave-Penney Memorial erected in memory of a local soldier who was killed in the First World War. It is situated on the lower slopes of Corndon Down in the Dartmoor National Park, high above Dartmeet. Being close to the road, it attracts many visitors. The inscription below the cross reads: To the glory of God And to the dear memory of Evelyn Anthony Cave-Penney Lieut. Q.V.O. Corps of Guides Fell in Palestine whilst Gallantly commanding his men June 8th 1918, aged 19 Look up and lift up your heads. I was enjoying a morning walk to Combeshead Tor on Dartmoor. It was a hot August day and I was feeling the heat so intended to have a short break when I reached the tor. When I got there, I was rewarded by finding this family of Dartmoor Ponies with foals, their tails swishing to drive away annoying flies. I watched them for a bit, with them pretty much ignoring me, then off they trotted to rocks further down. In the drought that we've been having, there doesn't seem to be much grass for the ponies to graze on, but I understand the farmers who own them (and they are all owned) come out on their quad bikes to supplement their feeding. ....Those dark clouds promised rain - but it didn't come. We would certainly have been glad of it. In this image, the Narrator Brook is flowing under the clapper bridge along the track that leads down from Deancombe in the Dartmoor National Park. The stone bridge is just wide enough to cross on foot or on a cycle. There are many such bridges on the moor - some quite ancient, and some much bigger - such as the iconic one at Postbridge. The track from here eventually goes uphill quite steeply to the lower slopes of Sheeps Tor. This is a particularly lovely spot to take a break when out for a walk and you can, more often than not, have the place to yourself. An amazing sunset, which looked as if the sky was on fire, and all the more impressive as it covered such a large area of the sky. The photograph was taken in the Plaster Down area of Dartmoor, near Pew Tor at the beginning of October. The Narrator Brook cuts through the track that comes from Deancombe. The track rises up steeply a little further along eventually coming to the lower slopes of Sheeps Tor. The small stone clapper bridge, is just wide enough to allow walkers and cyclists to cross, though you might choose to stop and rest awhile by the brook. It certainly is a delightful spot to stop, and maybe take some refreshments whilst enjoying the sound of the water splashing over the rocks and stones. Huccaby Farm is in the Hexworthy area of the Dartmoor National Park. Nearby is the river of the West Dart, Hexworthy Bridge and, going uphill, The Forest Inn. 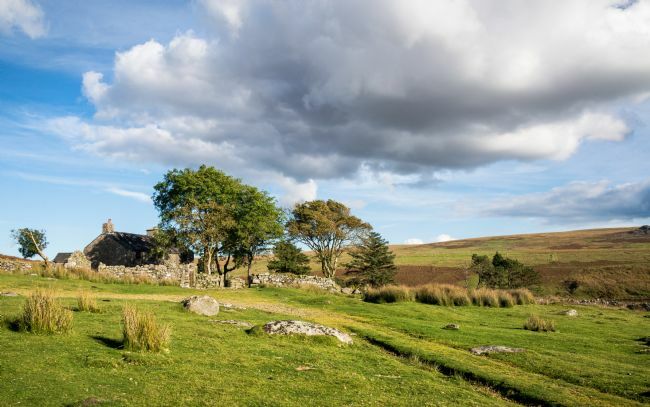 There is also a lovely campsite here, which, being in the middle of the moor, is a perfect location to explore Dartmoor. From here it is a short drive to Dartmeet, a popular tourist spot, and where you can get a bite to eat, an ice-cream - or just sit by the river. 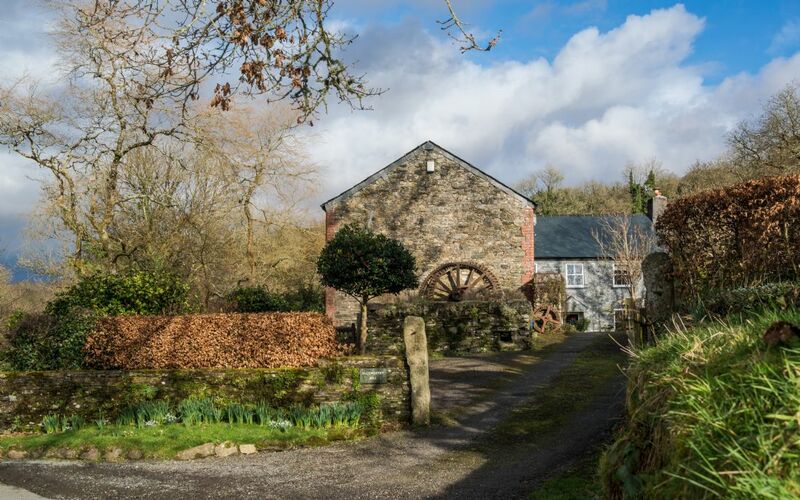 Huccaby Farm is in the Hexworthy area of the Dartmoor National Park. 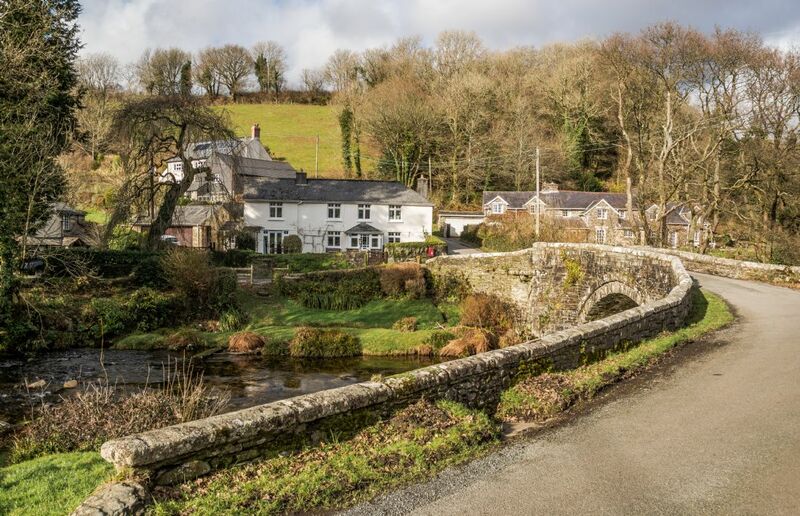 Nearby is the river of the West Dart and Hexworthy Bridge, and going uphill is The Forest Inn. 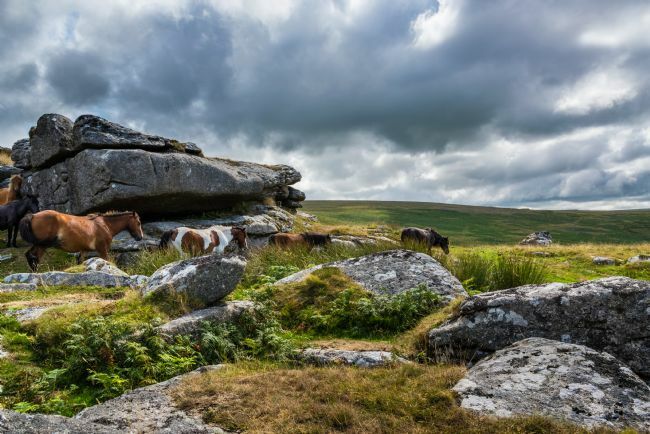 There is also a lovely campsite here, which, being in the middle of the moor, is a perfect location to explore Dartmoor. From here it is a short drive to Dartmeet, a popular tourist spot where the East Dart and West Dart rivers meet and where you can get a bite to eat, an ice-cream - or just sit by the river. Pew Tor is an impressive tor on Dartmoor and one that is easily accessible. It is located in the Moortown area not far from Sampford Spiney. Nearby is Feather Tor and the iconic (and much photographed) Windy Post Cross with its small waterfall. This photograph was taken in early October when the moorland takes on the colour of the dead bracken, a sure sign that autumn is well underway. The view west across the Dartmoor landscape from Pew Tor. This impressive tor is one that is easily accessible as it is quite close to the road and parking area. It is located in the Moortown area not far from Sampford Spiney. Nearby is Feather Tor and the iconic (and much photographed) Windy Post Cross with its small waterfall. This photograph was taken in early October as the moor was taking on its Autumn colours. The woodland is coming to life in early May on the Narrator Plantation. This plantation is on the northeast side of the Burrator Reservoir in the Dartmoor National Park. Fairly close, beyond the trees, is Sheeps Tor which dominates the local landscape and the hamlet of Sheepstor which nestles beneath it. In this scene, the colour of the new leaves echoes the colour of the moss covered rocks. Moss is in abundance on Dartmoor: on the rocks, the tree trunks and sometimes their branches too have an attractive covering. This area is beautiful in autumn, but for me, it is the fresh spring colours I love the most when new life is beginning all around. The River Plym here is just south of Shaugh Bridge on the Dartmoor border in Devon, UK. After heavy rain, the river crashes noisily over the boulders and rocks of the river bed. It is a dramatic sight (and sound) at these times, but always a wonderful place to be and to walk along the riverbank. On the northern side of the bridge, which falls into Dartmoor, the River Meavy joins the Plym and from here, the river makes its way to the sea at Plymouth Sound. Sheeps Tor seen from Lowery Cross on Dartmoor. In the valley between here and the tor, is the large expanse of the lovely Burrator Reservoir. If you go to the left at this junction, it will lead you to Crossgate and on to Leather Tor Bridge. A pleasant walk at any time of the year. Going to the right will take you down to the road that circumnavigates the reservoir. A walk all the way round is approximately four miles. A lovely winter day along the track from Lowery Cross to Crossgate. A short way along the track is this view through the trees to Sheeps Tor. Below the tor is the Burrator Reservoir, a glimpse of which can be seen in this image. Feather Tor is a small and somewhat insignificant tor in the Dartmoor National Park, though still worth a visit. It is very close to the more impressive Pew Tor in the Moortown area of Whitchurch. From Pew Tor, and to a lesser extent Feather Tor, many other tors can be seen; notably Great Staple and Cox Tor. 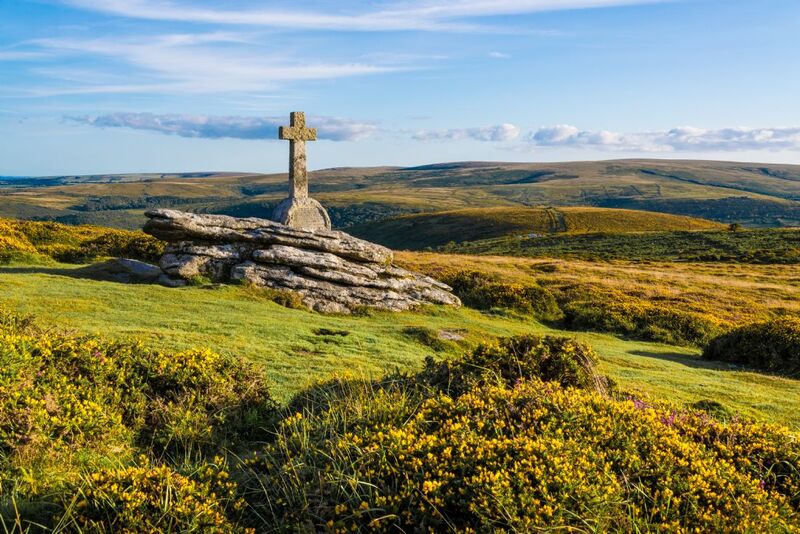 Also, a short walk from Feather Tor is the iconic Windy Post Cross and small waterfall - very popular with photographers. Huckworthy Bridge is in the pretty little hamlet of Huckworthy near Walkhampton in the Dartmoor National Park. This is a delightful area of the moor and it is easy to feel envious of the people who live in this charming hamlet. The lovely stone bridge is very narrow and has to be negotiated carefully when driving your car, and the roads approaching it are very narrow. But of course, this means not much traffic passes this way, so makes it a very peaceful location. This photo was taken on a beautiful winters day in February, with the sunlight showing the bridge and houses by the river at their best. Yar Tor is high up above Dartmeet in the Dartmoor National Park. It is easily accessible from the road that leads to Sherwell and Babeny stables. The views from this tor are wonderful and well worth the short climb from the small parking area. Dartmeet, down the very steep hill, is a popular place for tourists where the West Dart and East Dart rivers meet. This is a lovely place for a break where there is somewhere to eat, drink or just buy an ice-cream. 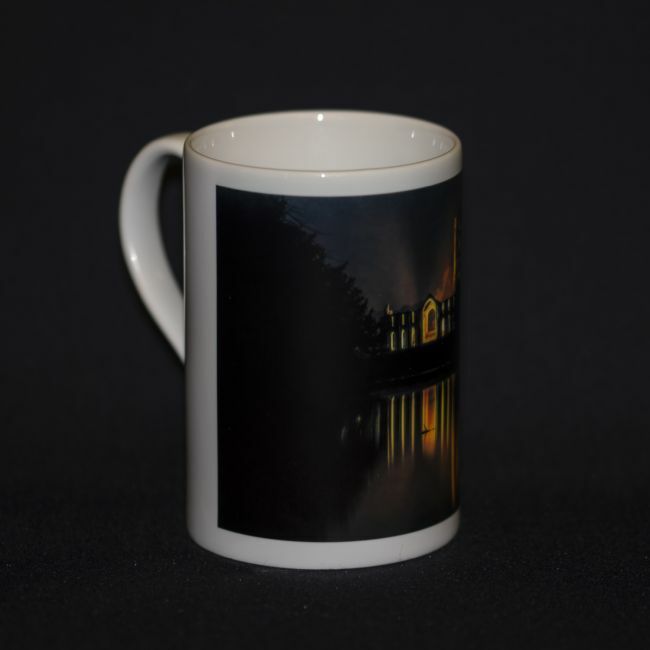 It does get very busy in the holiday season, but visit in the winter and you can sometimes have the place to yourself. This is on Sheeps Tor - looking towards Leather Tor and Sharpitor just before sundown in late August. Here, someone is just sitting and taking in the view, enjoying the warmth of the evening sun. This is a tor which can be climbed quite easily if you are reasonably fit, and is well the effort as the views up there are spectacular all around. The Burrator Reservoir is just below the tor, and looking lovely from up here. One corner of the tor has a steep section which is popular with climbers. 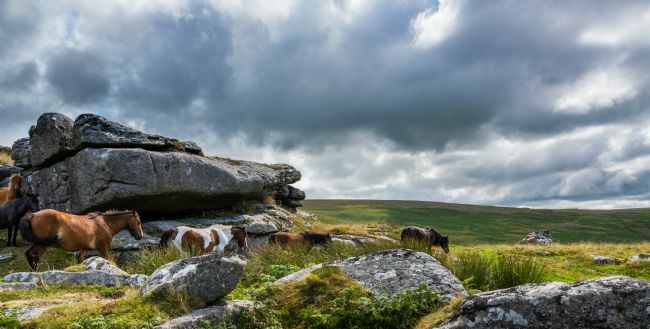 Why the tor has this name is unknown, though you will often find sheep as well as Dartmoor ponies grazing amongst its rocks. A young couple sitting on the rocks on the top of Sheeps Tor in the Dartmoor National Park. It was a balmy evening at the end of August and the sun was sinking in the sky. 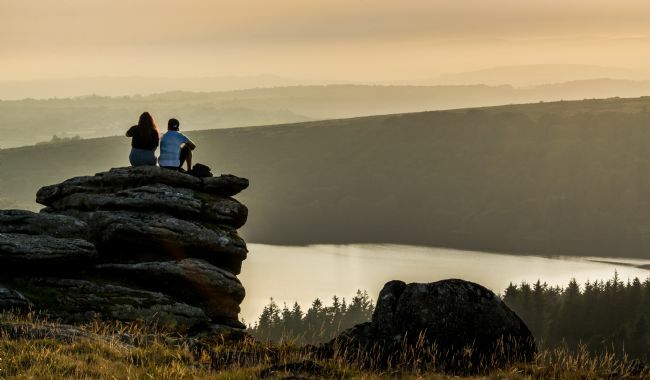 Below the tor, the water of the Burrator Reservoir shimmered in the sunlight - and beyond, a summer haze began to settle over the Dartmoor landscape. It was a good time to be in this place and watch the sun go down. A fine reward for the effort of climbing up here. 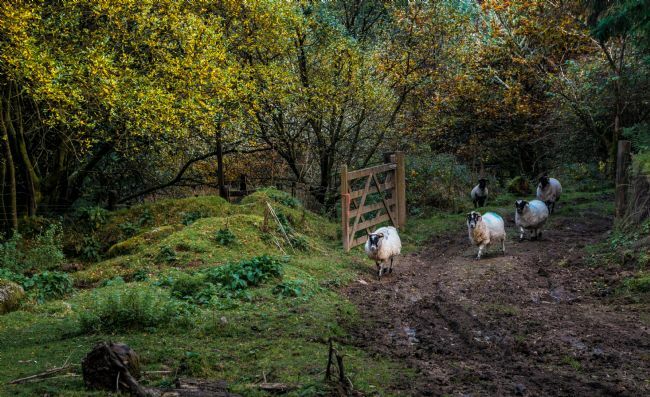 An autumn stroll along the track to Deancombe from Norsworthy Bridge near Burrator on Dartmoor. Autumn along the track to Deancombe. 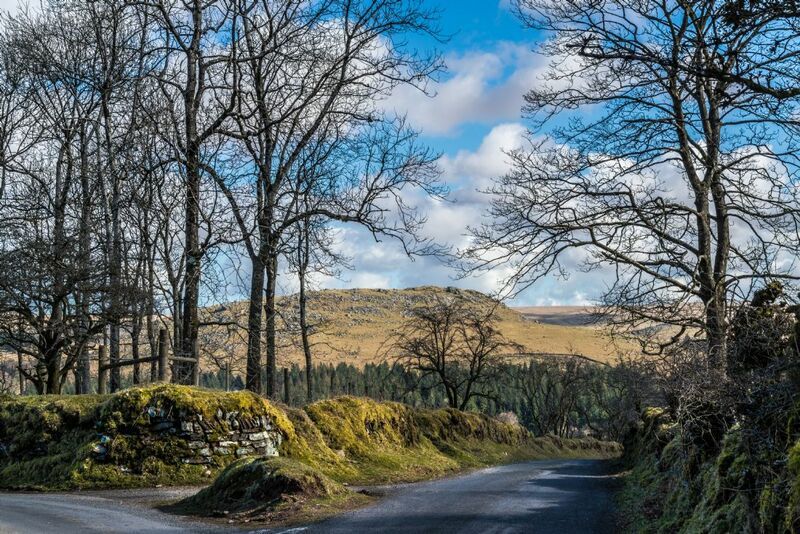 The track leads from Norsworthy Bridge, Burrator in the Dartmoor National Park. A pleasant stroll any time of the year but especially in autumn and spring. From Ingra Tor in the Dartmoor National Park. In the distance, middle of the shot is Staple Tor with sunlit Roos Tor beyond. This view is overlooking the charming little village of Sheepstor, and the nearby Burrator Reservoir which is just a short walk from the village. The village church, which can be seen in this image, is the 15th-century, granite built church of St Leonard's. On the hillside above the hamlet of Sheepstor in the Dartmoor National Park. The photo was taken as the sun was going down on the eve of the Autumn Equinox. I was attracted by how the sun lit up the hawthorn tree in the foreground and the top of Sheeps Tor. The somewhat moody sky made a great backdrop. This location is close to the Burrator Reservoir - a popular place for walkers, joggers, cyclists, horse riders and people just wanting to enjoy time in that beautiful area.